Last month I participated in Jihva for Ingredients #1 : mango. The ingredient for Jihva this month is strawberry, and the event is hosted by the Baking Fairy. Over the past month, I have been making all sorts of strawberry desserts: strawberry juice, strawberry marshmallow, strawberry ice cream and strawberry short cake (which will soon be posted). With strawberries on my mind, I chose to try a recipe that has intrigued me for some time — a strawberry terrine with fresh coconut. This strawberry terrine is from the Notebooks of Michel Bras: Desserts. The ideas in Bras's book are exquisite and original. His poetic sensibility for art and food is apparent. Throughout the book are sketches, recipes, information about ingredients and photographs of nature. The book ties together all its elements in an atmosphere of creativity, imagination and pleasure. The composition of the terrine is actually rather simple. The tricky parts are: (1) defrocking the coconut; (2) making sure that your softened butter incorporates with the coconut, sugar and water mixture; and (3) cutting the finished product, as it is rather pliable. The difficulty cutting the dessert results from the high proportion of strawberry to coconut: you need to pack the strawberries tightly because they are basically holding themselves and the dessert together. This dessert shows off the clean and distinct flavours of strawberry and coconut — a lovely and unusual combination. I recommend preparing this dessert three to four hours in advance to give it plenty of time to set. Wash the strawberries quickly. Drain them and remove the stems. Put aside on a dry towel. In a mixing bowl, combine the grated coconut, water, 1/2 cup (120 g) sugar, and softened butter. Mix thoroughly. Soften the gelatin in cold water and dissolve it in 2 Tbsp (30g) boiling heavy cream. Slowly mix the cream into the coconut mixture. Allow to set. Whip the remaining heavy cream and gently fold into the coconut cream. Cut 2 pt. of the strawberries in half. 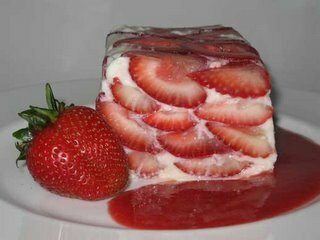 Alternate layers of strawberries and cream in the mold. Pack the strawberries in as tightly as possible. Remember that this is a strawberry terrine with coconut and not the other way around. Chill the remaining strawberries at least 1 to 2 hours. Prepare the coulis by blending the remaining strawberries, sugar and red wine. Remove the terrine from the mold by placing the mold in a basin of hot water. Slice the terrine with a knife dipped in hot water. Serve with the coulis. Posted by Sam at 11:38 p.m. I found your blog because you found mine, and too will be adding yours to my list of usual suspects. Thanks for the Michelle Bras book tip, I hadn't heard of it before (shameful) and have promptly ordered it for my own collection. Thanks. I wish I could prepare a new recipe everyday! Thanks for visting. Love your blog! How in the world did I miss this one??? You had me at coconut, Sam! This is an awesome dessert, now that strawberries are in season. It also gave me an idea for a coconut and strawberry cocktail. Great website by the way, you have a lot of really good recipes.